ADDRESS: 1409 Branch Street, Tallahassee, FL 32303. In Midtown ~ desirable Levy Park. Totally renovated cottage. Near the M Bus Line. UTILITIES: Tenant pays for all Utilities: City of Tallahassee, Garbage, Cable TV, Internet and Phone. Property Manager checks/changes Air Conditioning Filters Monthly. PETS: May be considered. There is a 30 pound limit for the pet weight. There is a Pet Application and Interview with the Pet. Pet Fee varies with the Pet ($250.00 minimum per Pet). This is Non-refundable. With pets, the tenant must have a Tenant’s or Renter's insurance policy addressing Pet Liability. FLOOR PLAN: Living Room open to Kitchen with Bar between. Dining Nook in Kitchen. Square footage approximately 730 heated and cooled. KITCHEN APPLIANCES: Refrigerator with Ice-maker, Dishwasher, Range, Microwave and garbage disposal. LAUNDRY APPLIANCES: Stacked Washer and Dryer. DEPOSIT FOR DAMAGE: $1,100.00 (this is not the last month’s rent) Property Manager visits monthly to pick up the rent check and check/change the HVAC filter. APPLICATION: Written Application for Verification of Rental History, Employment and Income, Credit Report, etc. $50.00 Application Fee Per Person or Married Couple. Application Fee is Non-Refundable. SCHOOLS: Ruediger Elementary, Raa Middle and Leon High Schools. PARKING: Parking for two cars. AMENITIES: Midtown is the place to live! Close to the Downtown Hub. Work, restaurants, nightlife, near FAMU and FSU! 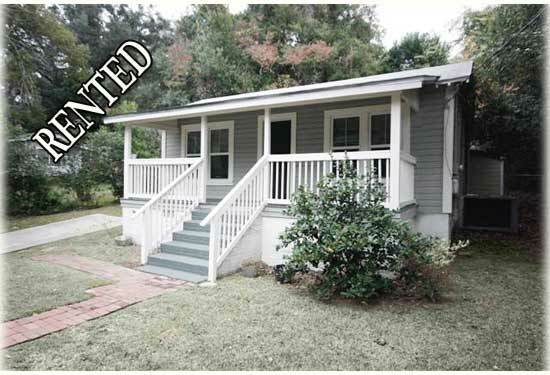 Renovated cottage with 2 bedrooms and 1 bath. Open living room-kitchen and dining. About 728 sf. ft. Updated kitchen and bathroom. Wood Bamboo flooring and tile flooring. Cool lighting.